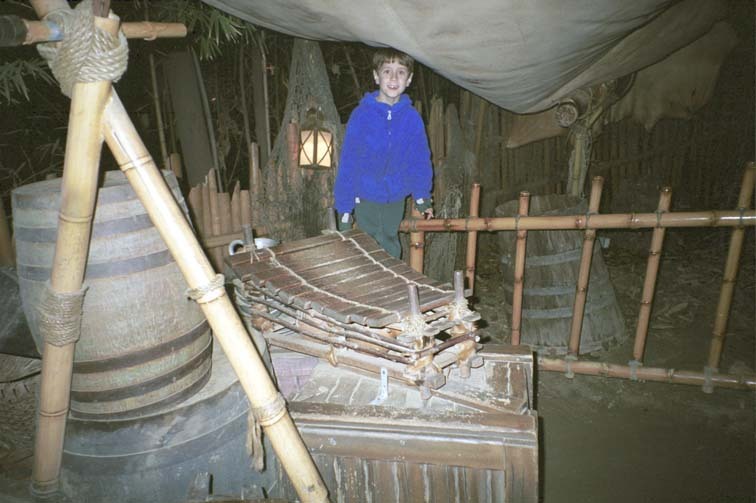 We rode Space Mountain, Indiana Jones, Pirates Of the Carribean, and the Matterhorn, but Thomas went back three times to Tarzan's Treehouse in Adventureland. It isn't even a ride - it's an outdoor puppet, light, and sound recreation of a tree environment from 19th-century explorer African jungle. The entrance to Tarzan's Treehouse is up a ladder, just off to the right in this photo, and across this rope and slat bridge. You see a broken boat rowboat overhead, encounter a journal, and follow a path to a hut with a tiger looming over. The tiger screeches and you read of the fate of Tarzan's parents. 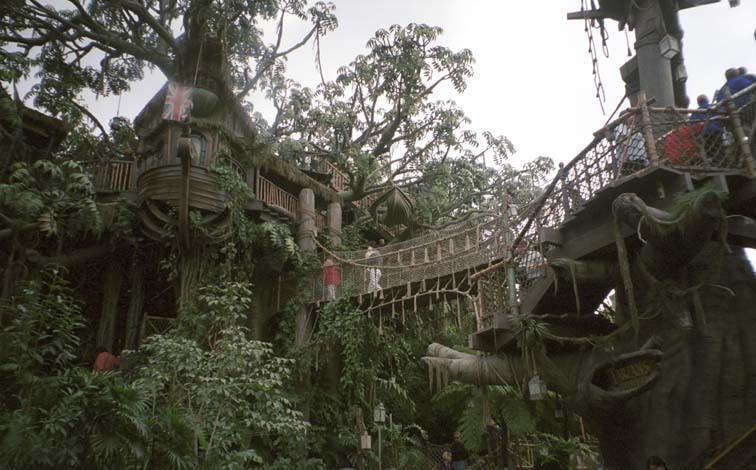 The path through Tarzan's Treehouse is a climb along and down a series of boardwalks past various huts where you learn about the story of Tarzan and of Jane. At the bottom of the attraction are a pair of tents. In one tent are 19th-century European explorer artifacts and in the other tent are 19th-century African artifacts. Here, Thomas stands behind some of the African musical instruments. They made an appealing racket - in this case, a drum and a xylophone. 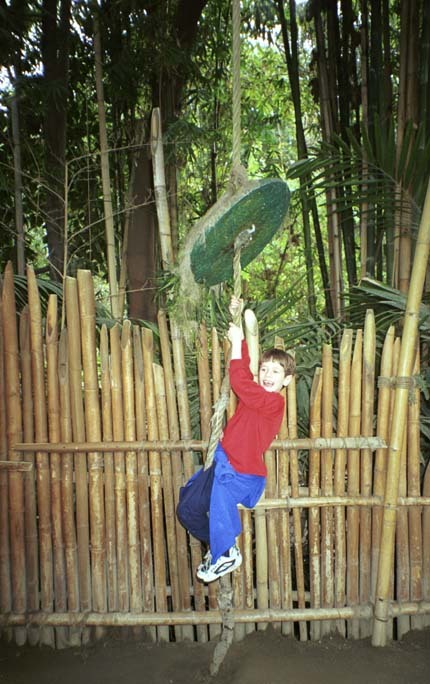 Thomas had great fun on the rope ladders. 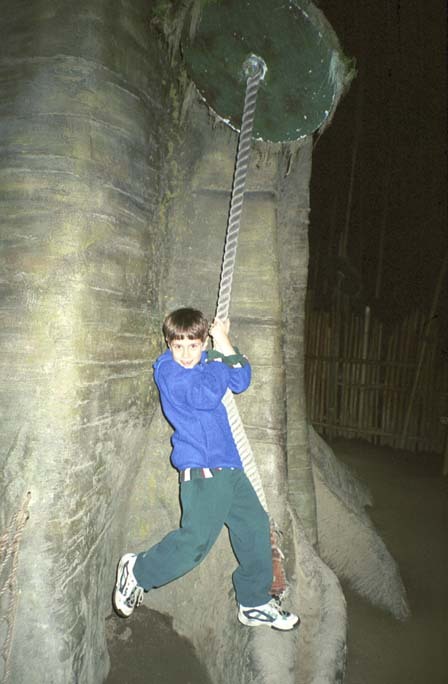 Here is Thomas on the second rope ladder.